1988 Topps Traded Baseball is a set for the fans. The checklist is filled with players who had solid to strong careers that were bolstered by their hometown popularity. 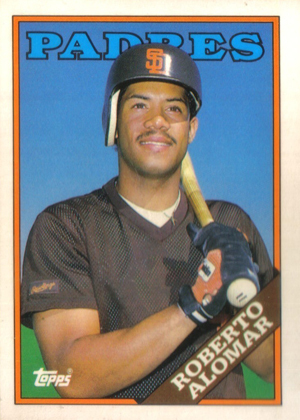 Roberto Alomar is the set's anchor rookie. Outside of that, 1988 Topps Traded Baseball has first-year cards of several well-known players who have strong hobby followings, even in retirement. Included in this group are Mark Grace, Jay Buhner, Jim Abbott, Tino Martinez, Robin Ventura, David Wells and Ron Gant. The 132-card checklist includes more than 20 members of the American team that won the gold medal at the 1988 Summer Olympics in Seoul, Korea. The design maintains the look of 1988 Topps Baseball. Player photos have a thin frame and white border. A diagonal strip in the bottom-right of the card has the players name, with the team name behind the player at the top. Despite the strong checklist, 1988 Topps Traded Baseball sets remain easy to find for a cheap price. It is one of the most heavily printed of the Topps Traded box sets. 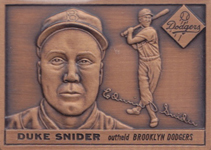 A bronze mini card reprinting the 1955 Topps Duke Snider was given to dealers as a case incentive. The small but solid card measures 1 1/4" by 1 3/4". DAVE HENDERSON 1988 Topps Traded ERROR Miscut BACK Partial DAVE PARKER 2x A's!! Card measure 1 1/4" by 1 3/4" and reprints the 1955 Topps Duke Snider card. It was given to dealers for ordering cases. Topps 1988 Traded Series Baseball Cards. Complete Set.